Did you notice anything different in our error page? If not, try clicking this link. We've implemented some new code, thanks to Proud Errors. Often enough, when typing an URL into the address bar, a letter is misplaced, leading you to a 404 error page instead of what you've been looking for. Most of these error pages are quite boring, but there's the odd few that might just put a smile on your face (like the one below). Proud Errors is an initiative co-developed by Idyllic Software, with support from GlobalGiving, to make the world a better place. 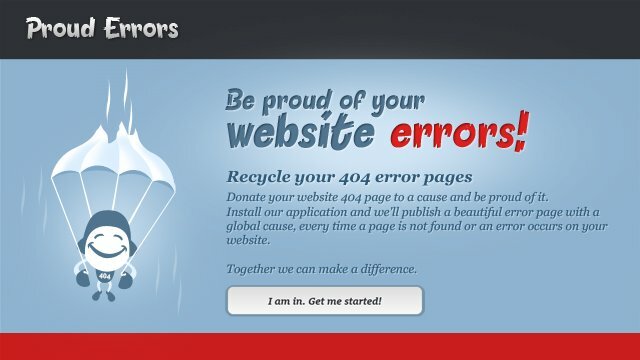 Proud Errors, with just a few clicks (and information), will give you some code, which you can embed into your website. Many causes are available to choose from, anywhere from fighting animal cruelty to campaigning for women's rights. At [blank]'s Universe, we chose the Technology category. Some of our potential causes include providing internet or computer access to developing nations. Users can elect to choose a "full page" format, as we have done, or can simply embed it into existing code, giving a result like the one below. If you have a site and are looking to support a cause, check out Proud Errors' Erlibird below, or their site here!